1. Mexico played a leading role. This had been clear leading up to the OAS meeting based on second-hand reports and statements from Mexico’s own Foreign Relations Secretary Luis Videgaray, but it was made explicit in Tuesday’s meeting. In his remarks, Mexico’s OAS Ambassador Luis Alfonso de Alba asserted that his country had both the “political will and necessary instruments” to stimulate a new stage of dialogue in Venezuela. While it is unclear exactly what avenues this diplomatic pressure will take, de Alba said that Mexico—which will host the OAS General Assembly in June—has an interest in holding regular, monthly discussions of the situation in Venezuela. Moving forward, potential pressure points include the ones made in the joint statement issued by 14 of those countries on March 24: promoting dialogue and negotiation between the government and opposition, the release of political prisoners, the recognition of the National Assembly, and the establishment of an electoral timetable. The OAS meeting saw further proof of the perils of full-throated U.S. efforts to line up the rest of the hemisphere against Venezuela. Senator Marco Rubio’s (R-FL) not-so-veiled threat to the governments of Haiti, El Salvador, and the Dominican Republic that it would be “very difficult” to defend economic assistance to those countries if they did not vote with the United States on Venezuela failed on two fronts. First, the threat had no effect on the votes of these countries (all three strongly opposed and voted against approving the day’s agenda to discuss the situation in Venezuela). Second, Sen. Rubio’s remarks provided a convenient adversary for Venezuela, and were repeatedly invoked by the Venezuelan representative as evidence of U.S. coercion to support an “interventionist” plot. 3. This was more of a debate over appropriate paths to address Venezuela’s crisis than whether or not there is a crisis. Venezuela based much of its arguments on claims that it was the victim of internal and external actors plotting against the country’s constitutional order. However, the majority of the other countries that either abstained or voted against discussing the situation in Venezuela—including Nicaragua and Bolivia, Venezuela’s most vocal allies—provided rationales that were based almost exclusively on arguments of sovereignty and the OAS Charter’s principles of non-intervention. This may seem like a minor distinction, but it’s actually quite important. It demonstrates that even if there is no consensus in the Americas over how to ensure that Venezuela commits to addressing its crisis in meaningful ways, there is less willingness to contest the facts regarding Venezuela’s dire economic situation and break from democratic order. 4. The Caribbean countries are split, but shifts show decreasing support for Venezuela. When comparing Caribbean nations’ votes in Tuesday’s OAS Permanent Council meeting with last year’s meeting, only four of these countries changed their position. Of these, only Suriname (which went from supporting a debate over Venezuela in 2016 to opposing it) changed its position favorably for Venezuela. The rest of the changes (Antigua and Barbados going from “No” to abstaining, Grenada going from “No” to being absent from the floor, and St. Lucia going from abstaining to “Yes”) adopted less favorable positions for Venezuela, suggesting that its “soft power” in the Caribbean via programs like Petrocaribe is waning. 5. Cool-headed diplomacy prevailed over squabbling. When Venezuela was given the final word at the end of the discussion, it resulted in a bit of a spectacle. The Venezuelan government began to attack other countries in the OAS one by one, especially targeting Brazil, Colombia, the United States, Mexico, and Canada. But while there were some testy responses (Brazil strongly objected to being called an illegitimate “golpista” government, and Mexico at one point threatened to leave the chamber in protest of the tone being used), Venezuela was unsuccessful in focusing the discussion on other countries. Instead, some of these countries acknowledged that they were indeed facing challenges of their own, but that they were seeking international assistance to address them. Colombia, for example, stressed that it appreciated the work of all of the countries that have assisted its efforts to resolve its 52-year long armed conflict. Such statements helped refocus the debate, and ended the session on a higher note. 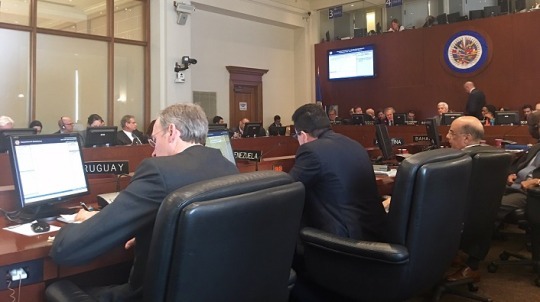 It is true that Tuesday’s Permanent Council session ended without a vote on anything other than the session’s agenda, just as the 2016 meeting did. This was no coincidence, as it is difficult to see what a vote would have achieved. A vote over the statement issued by 20 nations that urged concrete diplomatic solutions, for instance, would no doubt have been loudly opposed by Venezuela and its allies, especially Nicaragua and Bolivia. They made it clear that they considered the OAS discussion of the situation in Venezuela without the Venezuelan government’s consent to be an illegal violation of sovereignty. The fact that there was no vote also shows there is no appetite for pushing to remove Venezuela from the OAS. For now, at least, countries looking to address the situation framed their interest as helping, not punishing Venezuela. This is not the end of the line. The lack of a vote on next steps does not mean that there are no options being pursued. The statements from Mexico and others suggest that there could still be some resolution and “good offices” diplomacy with regards to Venezuela, as laid out in the Inter-American Democratic Charter. Whether this diplomacy will be carried out through the OAS, another forum, or through bilateral channels remains to be seen.